For a series of audiences during the Princess of Asturias Awards celebrations on Friday, Queen Letizia of Spain wore one of her most versatile pairs of earrings. The earrings are the "Kraz" model by Coolook, a Spanish brand. They feature a stud set with a mother-of-pearl cluster and interchangeable drops. 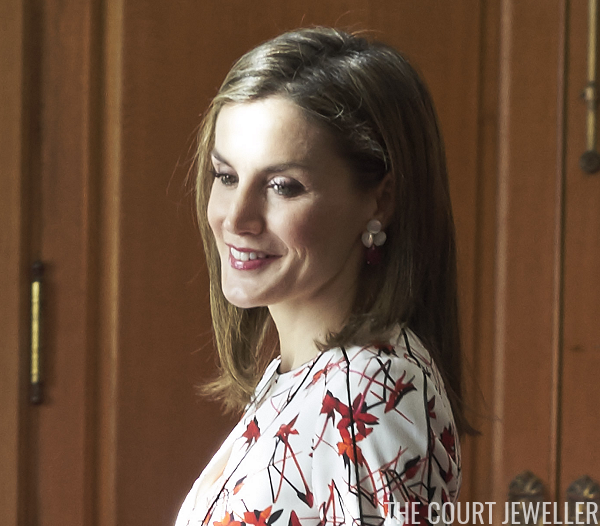 For today's engagements in Oviedo, Letizia selected the pear-shaped raspberry agate drops. Here's a look at Letizia's entire ensemble (plus, as always, handsome King Felipe). I think the dress is absolutely gorgeous.